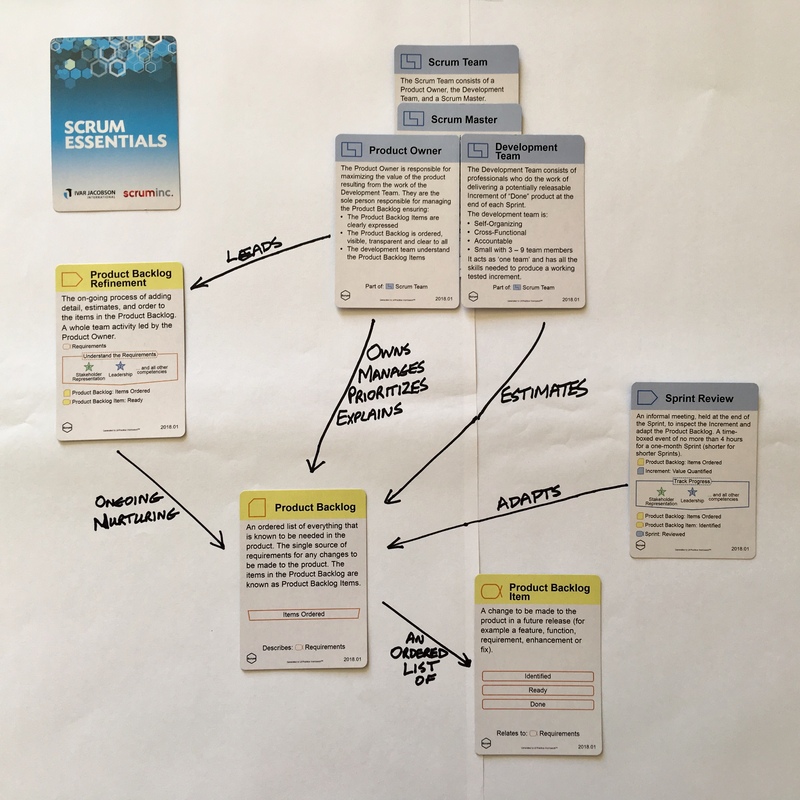 Read Part One, Two and Three of the Better Essence Through Scrum series here. To truly understand a subject area it is important to know more than just individual concepts, but also how they relate to each other. A concept map can be used to organise and structure knowledge and depict these relationships. The Practice Mapping game applies this to the content of a practice, Scrum in this example. Use it to test the understanding of individuals or small groups, particularly as part of a training event. Arrange the cards that relate to it on a large piece of flip chart paper. The photo shows one partial Practice Map in progress, focussing around the Product Backlog. There is no ultimate right answer, but it does reveal how people think and will quickly show any misunderstandings or big gaps in knowledge. It looks quite simple and there are many clues on the cards themselves, but it is deceptively hard to give good names to the relationships even if you are familiar with the subject area. It makes you think and gets to the real deeper workings of the overall practice. Try creating a map yourself with the cards, and if you run training events then try incorporating this game. You can potentially use it at the beginning to introduce the key words and see the level of existing knowledge, then play it at the end to confirm the full understanding and deal with any areas still causing confusion. If playing this game with many people at the same time, you can get smaller groups to focus on a subset of the cards around different key items. Then after they present back their part, the whole group can determine how these smaller maps can be joined up to create a map of the whole practice. Alternative Usage: Try out this game when you interview someone who claims to understand Scrum. They may be able to endlessly talk around the subject but it’s harder to work out if they truly understand it. Give them some of the cards and get them to create this kind of map to demonstrate their understanding and get a quick peek into their mental model! Happy mapping and come back soon for the next game in the series.